Nigeria international Aminu Umar scored twice as his Osmanlispor FK side toppled Akhisar Belediye Genclik Ve Spor 3-2 in the Turkish Süper Lig at the Osmanli Stadi on Monday, 25 December. Musa çagiran had earlier put the Ottomans ahead from the spot with 27 minutes played before Soner Aydogdu struck nine minutes later to restore parity for the visitors. Umar got onto the end of Ozer Humarci's pass to make it 2-1 two minutes after the restart but the resilient Akigo outfit rallied back to pull level again through Aydogdu who stepped up to send Osmanlispor goalkeeper Karčemarskas the wrong way on the hour mark. 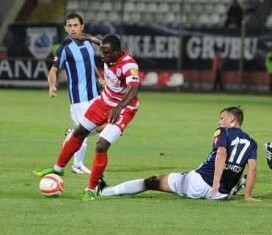 The Nigerian would ensure his side bagged all three points from the encounter after ömer Bayram was sent off for the visiting team after 64 minutes , notching his second of the evening four minutes later to secure the win, his latest double making it his fourth in the Turkish topflight this campaign. Fellow Nigeria international Raheem Lawal who was equally in action for the hosts was replaced with eight minutes left on the clock while the 2016 Olympic Bronze medalist went the entirety of the clash. Next up for Osmanlispor who are placed 14th on the division standings is a Turkish Cup Round of 16 engagement with Besiktas on Thursday 28th December.